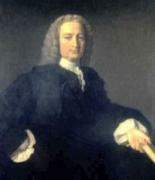 Francis Hutcheson was born in the townland of Drumalig, Saintfield Parish on 8 August 1694, the son and grandson of ministers of dissenting congregations. Educated partly by his grandfather, partly at an academy, he entered the University of Glasgow in 1710, where he spent six years, at first in the study of philosophy, classics and general literature, and afterwards in the study of theology. Hutcheson received his license to preach within the Presbyterian church in 1716. However, some controversy about his appointment to a congregation in Scotland persuaded him to abandon the ministry and begin a life of academia. He spent the early part of his academic career teaching at the Academy of Dublin, while he privately pursued his philosophical studies. In 1725 his name became well known within influential academic circles with the publication of his Inquiry into the Original of our Ideas of Beauty and Virtue. In 1729 he accepted the Chair of Moral Philosophy at the University of Glasgow. He remained at the University of Glasgow until his death, during a visit to Dublin, in 1746. Hutcheson's two primary works are the Inquiry into the Original of our Ideas of Beauty and Virtue (1725) and An Essay on the Nature and Conduct of the Passions and Affections, with Illustrations of the Moral Sense (1728). The remainder of his corpus includes: Synopsis Metaphysicae, Ontologiam et Phneumatologiam Complectens (1744), Philosophiae Moralis Institutio Compendiaria (1743), Reflections upon Laughter and Remarks Upon the Fable of the Bees (1750), and A System of Moral Philosophy - published posthomously by his son in1755. Hutcheson dealt with metaphysics, logic and ethics. His importance is, however, due almost entirely to his ethical writings, and among these primarily to the four essays and the letters published during his residence in Dublin. It is well established that Hutcheson contributed, in large measure, to the formation and development of some of the most important of the modern schools of ethics. He also influenced the works of the philosopher David Hume and the economist Adam Smith (a former pupil). He died on 8 August 1746.